Though I've now had the magical iPad for about a week now, yesterday was the first time I had a chance to actually mix a service with it. The service in question was our Sr. High ministry, which normally meets in another room on campus. However, due to some scheduling stuff, they were meeting in the main auditorium. 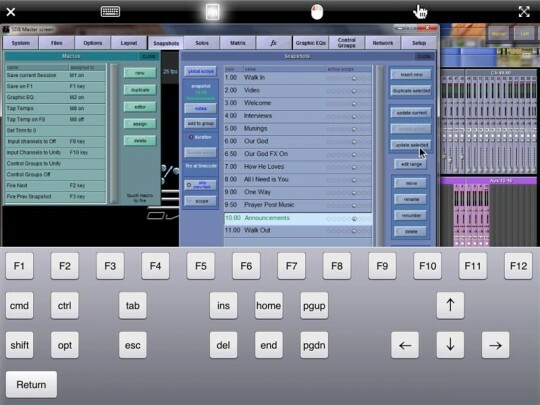 That meant I got to mix on the SD-8, and thus had time to play with the iPad. First I'll tell you how I did it, then what I thought of the experience. Our FOH location is far, far away in a balcony. It's a solid 45 second walk from the main seating area to the FOH location (and involves going out into the lobby, up 2 flights of stairs, back through the second floor lobby, through the balcony and into the tech booth; brilliant I know...). As that location is so far removed from what the people on the floor actually hear, remote mixing has been somewhat of a longstanding desire. As of this writing, it's not possible to directly remote into a digital mixer (though I'm hoping that DIGiCo will one day consider adding RDP to the OS...). Thus, an intermediary is required. In our case, we have a MacMini running XP (Bootcamped) running the SD-8 remote editor. The SD-8 editor is nice in the sense that it can be configured to control the audio engine as a separate remote, without effecting the surface. In other words, someone could be mixing on the surface, selecting channels or pfl, adjusting EQ or what have you, while the remote could be doing the same thing. They only bump into each other if both try to adjust the same parameter at the same time. You can also set the remote computer up as a complete mirror if you like. Anyway, once I launch the SD-8 remote on the Mini, I used an app called Desktop Connect on the iPad to Remote Desktop Connect into it. I like Desktop Connect because it features auto-discovery and will do both VNC and RDP. That means I can very quickly switch back and forth between the Macs and PCs at FOH and control the whole system from one app. Desktop Connect also uses gmail to allow you to sign in to any properly configured machine from anywhere. I haven't tried that yet, but will at some point. I've used other RDP and VNC apps on the iPhone and none connect as fast or reliably as Desktop Connect. Even when I put the iPad to sleep, it wakes up connected without issue. Score one for that setup. The band consisted of 3 vocals, 2 guitars, bass, keys and a full drum kit. I had 3 mono wedge mixes, 1 stereo wedge mix and a stereo ears mix. Because of the number of sources and mixes, I started the day off on the SD-8 surface. I got the gains dialed in, set up the monitors and had a rough mix in place. I had also pre-built most of my snapshots for the night. I then headed downstairs with the iPad. Desktop Connect enables two modes of mouse pointing. One is an offset mode, where moving your finger on the screen moves the pointer. The offset is variable and though it takes a minute to get used to it, it's very fast. The other is touch mode. I was hoping touch mode would be more useful, as the SD-8 is a touch-based system. However, at least right now, using touch mode was difficult. I couldn't reliably move faders with it, so mixing that way was out of the question. Touch mode is super-handy for switching screens however, and swapping modes is a simple icon touch. Overall, it worked pretty well. The only real downside is a function of one of the things I love about the SD-8; it's complete channel strip display for all 12 channels in a bank. Switching from one bank to another means every single pixel has to change, and that took a good 2-3 seconds to re-draw on the iPad. As I was finishing up this post, I started playing with a few things. I have the SD-8 editor running in Win7 Pro on my MacBook Pro under Parallels. When I connected the iPad to my MBP, bank changes were almost instant. What I don't know is if that extra speed is a function of Win7, the fact that I'm using VNC and not RDP, or the extra processing power of my MBP (the FOH Mac Mini is a CoreSolo 1.5 GHz...). More investigation is clearly in order, however, it does seem that we will be able to speed it up to a point where bank changes are not a real issue. The use of snapshots was simple, and I mapped the next snapshot and previous snapshots to F-Keys. Desktop Connect has a Function Key menu readily available; press the Fn icon at the top of the tray and the F-Keys immediately appear. I used those to advance through the show. Touching the glowing Fn button brings up the Function KeysThe thing that did bite me one time was having a snapshot set up incorrectly, which raised the lead vocal mic level to the point of feedback. It took a few seconds to get to the right screen to correct it. Obviously, on the surface, that would have been a half-second. Lesson learned—make sure your snapshots are clean before the service. Another lesson I learned is to take advantage of the SD-8's amazing configurability. I should have set up a fader bank with my most-needed channels in it; vocals, guitars, and a few VCAs. 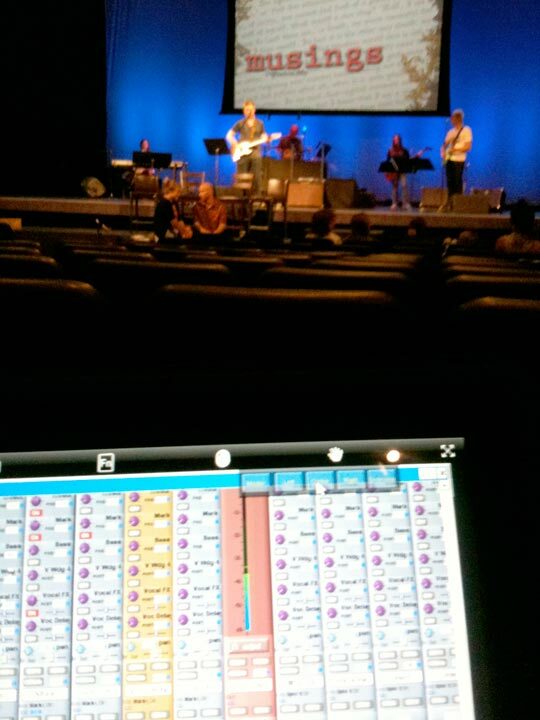 That way I could have easily mixed the entire service from one screen, and eliminated a bunch of switching delays. I'll do that next week.